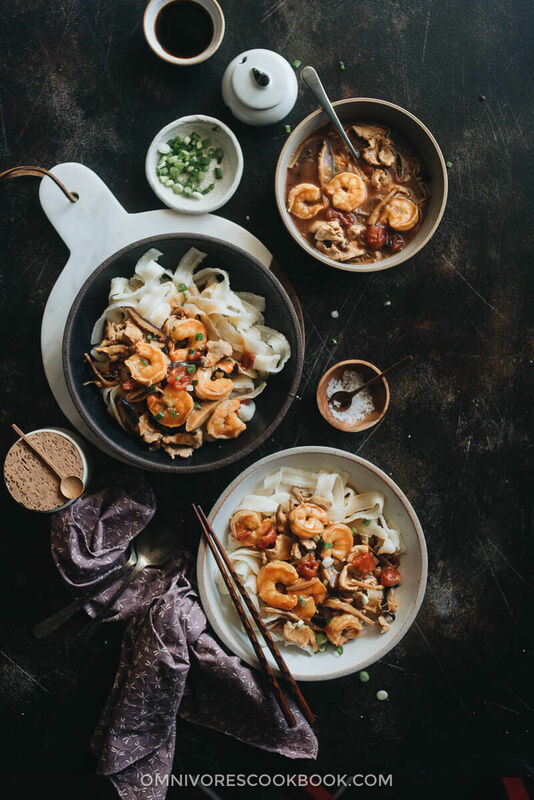 These traditional northern-style Chinese noodles are comfort food in the truest sense. The sauce cleverly uses a few dried ingredients to make a rich and complex tomato-based sauce that you’ll want to devour by itself. If I had to pick just one noodle dish to eat for the rest of my life, it would be this one. The noodle sauce is tomato-based. However it tastes different from any tomato sauce you’ve ever tried because of the added dry ingredients. The lily flowers and shiitake mushrooms add tons of veggie essence that make the sauce extra rich and full of umami. The sauce is so rich that you actually can turn it into a very flavorful vegan dish by simply skipping the pork and shrimp. 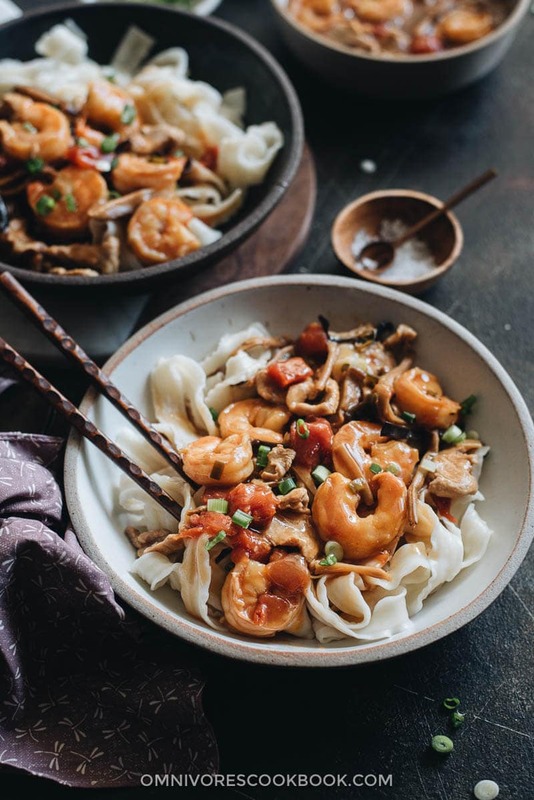 The original name of the dish is da lu mian (打卤面), a type of northern Chinese comfort food that is frugal and little-known outside the region. Da lu mian literally means noodles with any type of gravy or sauce, but usually refers to a simple sauce made with everyday ingredients. For example, a popular da lu mian uses the classic scrambled eggs and tomatoes as the sauce for the noodles. That one takes, like, ten minutes to make. The traditional northern-style sauce is a brown sauce very similar to this one, with just a little pork and no shrimp. It is designed to be made with the cheapest ingredients that every household already has in its pantry. 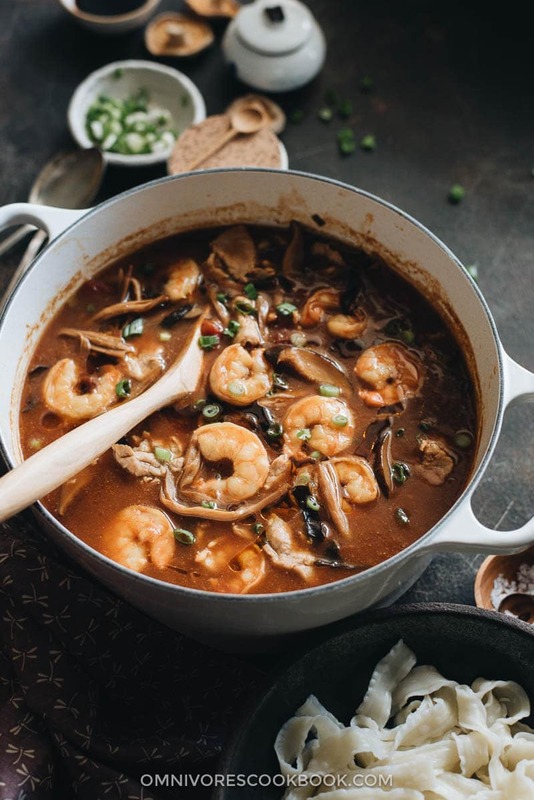 Of course, these dry goods are something of a luxury in the US, and you might need to make a trip to an Asian market or shop online to acquire them. 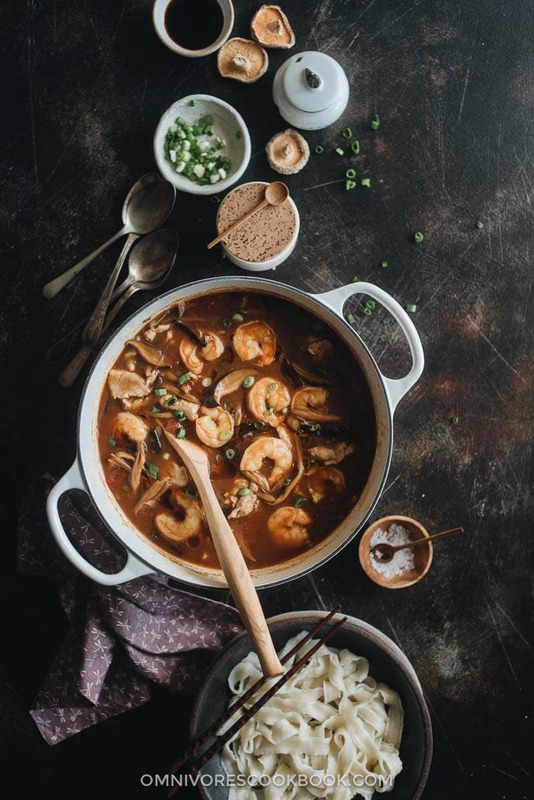 The recipe I’m sharing today is quite an elevated version and uses tons of pork and shrimp. 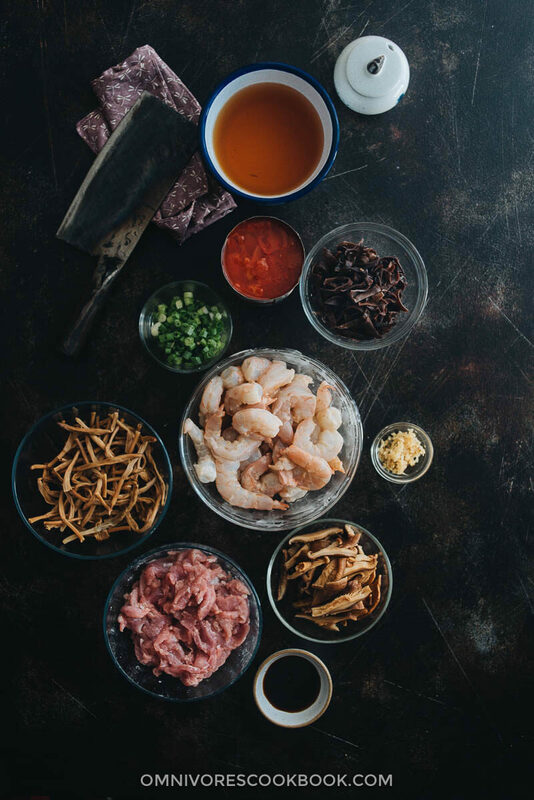 This is a family recipe that was handed down from my grandma and is a default celebration dish we serve at every Chinese New Year and at many family gatherings. My grandparents were quite wealthy in the old days, back when China still did not have a free market for everyday necessities. While the rest of the citizens had to use food vouchers to get rice and a limited number of veggies, my grandma could afford a few pounds of pork and even some shrimp here and there. She added these luxury ingredients to the noodle sauce, to make it a festive dish and, of course, to show off her wealth to the neighbors. So I consider myself to have been very spoiled and lucky, because now, the shrimp and pork version is the only one that satisfies my appetite. There was one time I served the sauce with hand-pulled noodles when I was catering a dinner party for a family. Most of the family had never cooked Chinese food before. And they were a bit concerned because the lily flowers and shiitake mushrooms smelled like mud when I was rehydrating them. The mom whispered in my ear that her six-year-old son probably wouldn’t eat the noodles and told me not to take any offense. She said he is a picky eater and prepared him some chicken and broccoli separately. When he tried the kid-sized sample portion of noodles, he got really excited and asked for more. The mom was stunned. And of course, that dinner party was a blast and ended with smiles on everyone’s faces. I previously discussed how to use Chinese dried veggies to create a superior flavor in another recipe – Buddha’s Delight, a Jai (Buddhist vegetarian) dish. The logic is the same here. The foundation of the broth consists of dried lily flowers and dried shiitake mushrooms. They both have a very concentrated smoky, earthy, and woody aroma. Once you rehydrate them, the rehydrating water will turn to a dark brown color as it becomes infused with great flavor. Do not throw this water away. It is the best vegan broth and you should use it in this recipe. The other dry ingredient is wood ear mushrooms. It is a flavorless fungus that adds a crunchy texture to the dish. The amounts of dried lily flowers and shiitake mushrooms can be difficult to measure. Feel free to use a bit more or less than called for in this recipe. You can add other vegetables into the gravy, too, such as Chinese cabbage, fresh mushrooms, and bamboo shoots. You can turn this dish vegetarian by skipping the shrimp, pork, and oyster sauce. In this case I’d highly recommend adding a bit more of the dry ingredients, plus some bamboo shoots and tofu. You can add various types of seafood, like squid and scallops, to make the sauce even fancier. You can add more salt, so the same amount of gravy can be used to serve more people. Or you can add a moderate amount of salt, and top each bowl of noodles with a huge amount of gravy and goodies. My family prefers the latter style. Sometimes we end up eating more gravy than noodles, simply because the gravy is so delicious. Handmade noodles are the perfect choice for special occasions. The next best choice is the wide, thick noodles that you might find in the refrigerated section of an Asian market. You can also use thick dried noodles (udon noodles). The recipe might look really long and intimidating. But trust me, the cooking is very simple and straightforward. It is a perfect recipe for a dinner party and/or celebration because you can prepare everything beforehand. You need to leave about 1 hour to rehydrate the dry ingredients. But if you’re short on time, you can also simmer the sauce for a bit longer to soften the ingredients faster. If you make the sauce beforehand, you can let the pot of sauce sit covered on low heat. But always boil the noodles right before serving. Although the recipe yields six servings, I highly recommend you make a full batch and not cut the recipe in half. This is the type of recipe that takes some time to prepare, no matter how many portions you make. Plus, the leftovers taste even better and you will finish them in no time. The prep time below does not include marinating time. The nutrition facts below are an estimate that doesn’t include the dried lily flowers and mushrooms, because those items don’t exist in the database. Gently rinse the dried lily flowers with tap water. Transfer to a big bowl and add 4 cups hot water. Rehydrate until tender, about 1 hour. Then remove tough ends of rehydrated lily flowers (*Footnote 3). Transfer 2 cups of the marinating water to another bowl without any of the solids that may have settled on the bottom. Set aside. Gently rinse dried shiitake mushrooms with tap water. Add mushrooms and 2 cups hot water to a big bowl. Rehydrate until tender, about 1 hour. Then drain and slice the mushrooms. Add wood ear mushrooms to a small bowl and add hot water to cover. Let rehydrate for 1 hour. When woodear mushrooms turn soft, gently rinse, drain, and set aside. 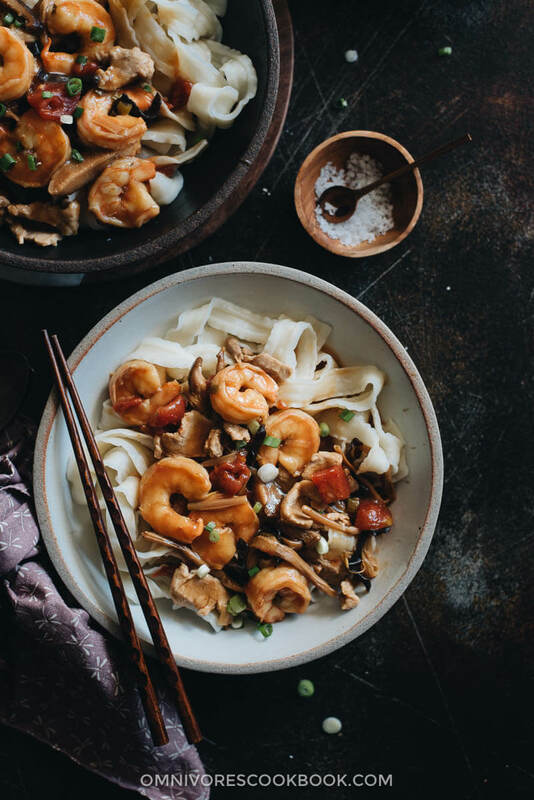 Combine shrimp, 1 tablespoon Shaoxing wine, 1/4 teaspoon salt, and 2 teaspoons cornstarch in a small bowl. Mix well by hand and marinate for 15 minutes. Combine pork, 1 tablespoon Shaoxing wine, 1/2 teaspoon salt, and 2 teaspoons cornstarch in a small bowl. Mix well by hand and marinate for 15 minutes. Chop and prepare the other vegetables. Combine the the 1/4 cup cornstarch with 1/2 cup water in a bowl. Mix well and set aside. Heat oil in a 5.5-quart dutch oven over medium heat until hot. Add lily flowers, shiitake mushrooms, and wood ear mushrooms. Stir and cook for 1 minute. Add green onion and ginger. Stir a few times until fragrant. Add canned tomato, stir, and cook for 1 minute. Add the 2 cups marinating water from the lily flowers, chicken stock, soy sauce, and salt. Bring to a boil over medium high heat, stirring constantly. Turn to medium low heat and simmer for 15 minutes. Add the shrimp. Stir and cook until the shrimp turn white, 1 to 2 minutes. Add the pork. Stir and cook until just cooked through, 1 to 2 minutes. Whisk the cornstarch water again and swirl in half of it. Stir until fully incorporated. Slowly add the rest of the cornstarch water and stir, until the gravy reaches the desired thickness (you will have some slurry left if you prefer a thinner gravy). Taste the sauce and add more salt if needed. Drizzle with sesame oil or homemade chili oil to finish up, if using. The sauce should be slightly salty by itself. Remove the pot from your stove and cover to keep hot. Cook noodles according to instructions. Drain and transfer to each serving plate. Serve the sauce hot over the noodles. Enjoy! Wide, thick noodles made with wheat flour work the best. 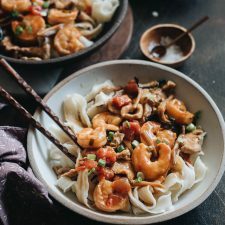 If you want the meal to be extra fancy, you can make hand pulled noodles. I used some oyster sauce to add more flavor and sweetness. If you do not have a bottle of it on hand, use 1 tablespoon soy sauce and 2 teaspoons sugar instead. Not all lily flowers have tough ends. Depending on the quality of your flowers, you might not need this step. Feel the end of the flower with your hand. If there is a thin, tough, woody stick (less than half an inch / 1 cm), snip it off and discard it. I posted this recipe back in May of 2015, but I have been improving the workflow ever since, to make it more friendly for Western kitchens. The recipe was updated in January of 2018 with quite a few changes. I just love recipes that have been handed down through the generations! And I love, love, love noodles – of all kinds! I’d have to say they are my absolute favorite food! This is like one giant bowl of comfort food! Recipes handed down have stood the test of time, and it’s definitely guaranteed to be delicious! I love using the shiitake soaking water too, it’s the best way to add a new depth of flavour to the dish! What a flavorful gravy! I love the use of shiitake mushrooms here…and I will have to look for lily flowers – what an interesting ingredient! Oh good heavens, these noodles look dreamy! I love those plump shrimp and lily flowers! Ooo! So good! This looks like hearty comfort food. The photos are absolutely gorgeous! This sounds fantastic and it’s perfect for the cold weather here in San Diego today – go figure. Lucky me, too, as I have both dried lily flowers and dried shiitake mushrooms in my pantry. Thanks, sound delicious! These noodles look so hearty and comforting, Maggie! I just love all the exotic flavors you have going on- what a treat! Wow, Maggie.. The noodles look so appealing and wanting to be taken a mouthful.. I am feeling hungry right now.. 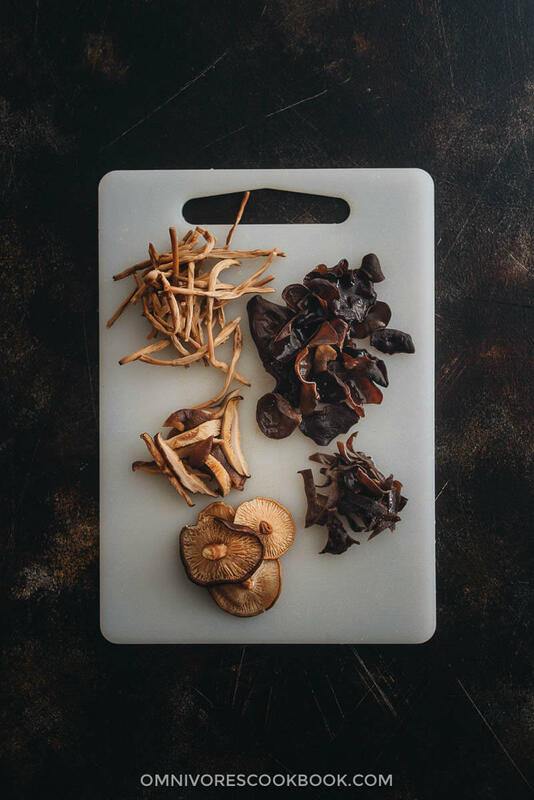 I can’t wait to try making broth with dried lily flowers and shiitake mushrooms! I was wanting to explore more ways to make vegetable broth that would give it more umami flavor and then I saw this. I love how you can collect all of your family’s dishes into a Mom’s Best Collection. I just happened to stumble upon your blog this morning and I’m so excited to try some of your recipes. This one though is one that I’ll definitely try and make soon. It brought back so many memories. My grandmother used to make noodles in brown sauce when I was growing up. It was the perfect pantry dish to make when there was little in the fridge. She was vegetarian, so hers didn’t include meat. I’ve searched for a recipe in the past, but I never knew what to search for, since I didn’t know the name for the dish. I’m bookmarking this so I can try to make a vegetarian version. Thank you! Hi Judy, I’m so glad to hear you’re interested in this recipe! This is my family’s favorite noodle dish that was passed down from my grandma. Just like you said, I don’t know how to accurately translate the name of the dish into English, to let more people to find it. For the vegetarian version, try adding some eggs (if you can eat them). And definitely use some fried tofu to add texture and flavor. I also use canned tomato instead of whole tomato sometimes, because off-season tomato can be tasteless sometimes. I would also add rehydrated wood ear mushrooms to add more texture to the dish. I’ve never made a vegetarian version but I think it will work. I love the “tried and true” recipes that have been passed on through families. I really want to try this recipe but tomatoes are a no-go in our house, will omitting them change the recipe too much? Looks so yummy. Love the use of lily bulb and dry mushroom. I will try it next time. Maybe my picky daughter will like it too. 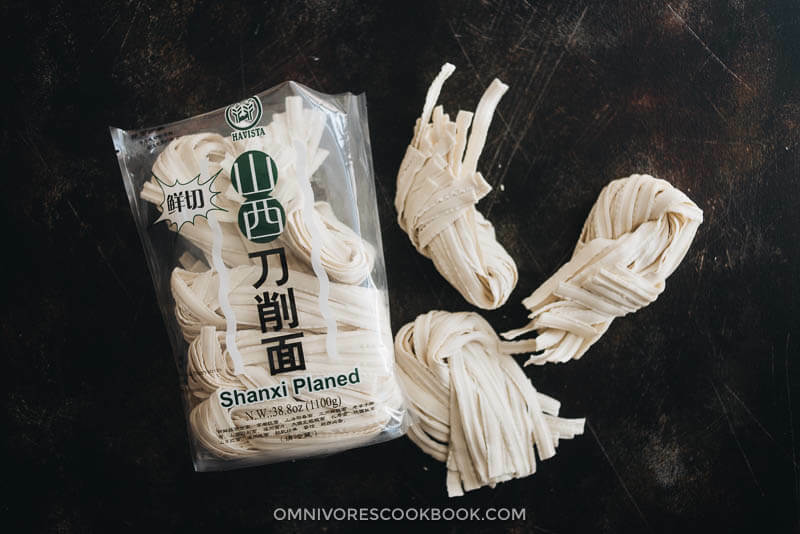 Can’t find the Shanxi Planed noodles anywhere online. Any suggestions? Hi Carol, I think your next best option is udon noodles. Pretty sure you can find them on Amazon. I agree it’s a bit of work but the end result makes it worth it. I took the liberty of adding another mushroom variety, in addition to those in the recipe. I cut down the Shitake by a third and augmented with wild organic “Lobster” mushrooms from B.C., Canada. Earthy, slight shellfish taste and they worked like a charm. This is my first comment but I follow this blog and have used several recipes. Well done. Thanks OMNIVORE. Hi Maggie, Your pic of the noodles cooked looks like funn? Their clearest like Funn noodles. I’m half Chinese, a senior still cooking for spouse. I cook Chinese, Japanese, and American dishes alot of winging Mediterranean dishes. And thank you for your posts. It’s fun to make but I think I failed it. It’s a taste I’m totally not used to and I think I did something wrong. Or maybe this is one of the things my taste buds are not accustomed to. The sensation of the mushrooms is quite special. It was edible but I am not sure if I did something wrong. My sause look about the same like yours, but I think I served to much sauce in the noodle bowl. Should I have discarded the broth when serving? I served it with broth and all.